(i) Area based Community Nutrition (ABCN) interventions. (ii) National Level Nutrition Intervention. VOSD had been implemented NNP in 37 Upazilas (Barisal Sadar, Gournadi, Jhalakathi Sadar, Nalcity, Rajapur, Kathalia, Hajiganj, Faridganj, Haimchar, Chandpur Sadar, Matlab South, Matlab North, Laxmipur Sadar, Raipur, Ramgati, Komolnagar, Kachua, Tongibari, Modhukhali, Amtoli, Mehendiganj, Charfasson, Manpura, Dashmina, Dewanganj, Melandah, Madarganj, Bhuapur, Sreebardi, Sherpur Sadar, Gauripur, Haluaghat, Iswarganj, Muktagacha, Nandail, Fulbaria and Phulpur) of 14 Districts (Barisal, Jhalakathi, Barguna, Chandpur, Laxmipur, Faridpur & Munshigonj) under seven Packages (Package No. 03, 15, 11, 22, 24, 27 and 29). This program was supported by Ministry of Health and Family Welfare and World Bank. VOSD had covered about 21,70,269 households and 1,12,66,150 population of Bangladesh. That program provided nutritional services through Community Nutrition Centers (CNCs) which were established in the community levels and each CNC covered about 1200 population of the community. VOSD had operated 9,059 CNCs in its operational areas and provided nutritional services. 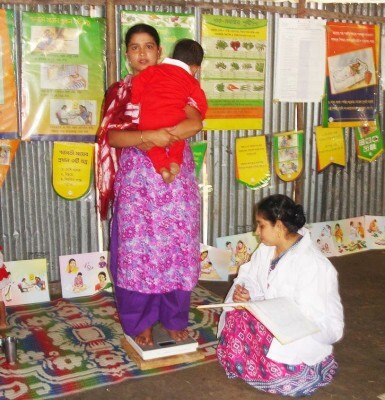 That program had 9,059 CNPs for 9,059 CNCs, 912 Community Nutrition Organizers (CNOs) for 9,059 CNCs/CNPs and each CNO operated 10 CNCs/CNPs, 235 Field Supervisors (FS) for 912 CNOs and 37 Upazila Managers for 37 Upazilas and other senior level staffs had been worked for the program. CNC was the nutritional service providing center for ultra-poor children and pregnant women of the community. That CNC run by Community Nutrition Promoter (CNP) and took responsibilities to make aware the local people.